Aaron Ramsey will leave Arsenal for free at the end of the season after the club told him in person why he will not be offered a new contract, Sky Sports News understands. The Wales midfielder was understood to have been unhappy that nobody from the club had directly explained their reasons for withdrawing the offer of a new long-term deal following months of talks. Ramsey had found out via his agent before speaking out publicly on the issue last week, telling a newspaper that he was hoping "somebody will come up and tell me why" the option to stay was taken off the table. Those discussions finally took place over the weekend, Sky Sports News has been told, as Arsenal drew 2-2 away at Crystal Palace on Super Sunday to retain a place in the top four after 10 games. Ramsey has now accepted that this will be his last season at the Emirates following a decade of service to the north London club, in which he has made 341 appearances and scored 59 goals since joining from Cardiff City for just under £5m in 2008. He was an instrumental part of Arsene Wenger's team, winning three FA Cups in 2014, 2015 and 2017 and scoring the winner in two of those finals, and he has made 15 appearances - including six Premier League starts - under new head coach Unai Emery so far this season. 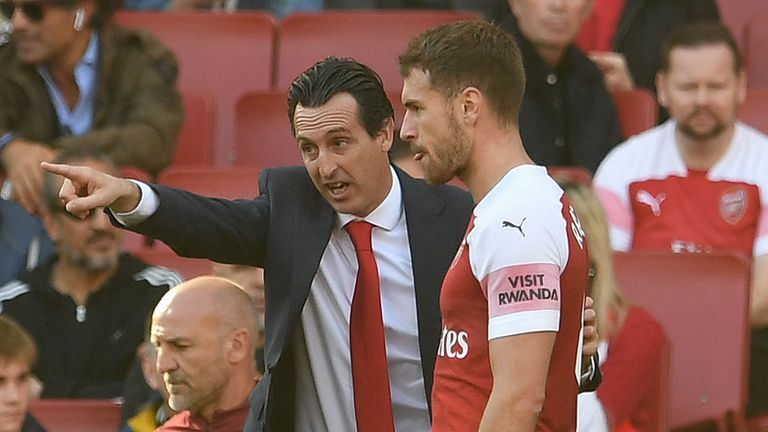 Emery has been pleased with Ramsey's performances and said last week he hopes the player will remain focused on the rest of the campaign. "Aaron and the club can speak and he can think for his individual contract with the club and with his thinking maybe of the possibility that he won't continue here," he said. "But, for me, for us and for the team, it's about being together and getting better and in each training for us."